Corona Cigar Company Blog: 3 Cigar Samplers you can only find at Corona Cigar Co.
3 Cigar Samplers you can only find at Corona Cigar Co.
You won't find these 3 Cigar Samplers ANYWHERE ELSE! These samplers are exclusive to Corona Cigar Co. so make sure to order an exclusive sampler today and show them off to your friends. That’s a total of ten cigars for one low price! Order yours today and see what the buzz is all about. 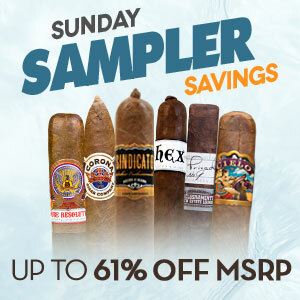 Enjoy these sixteen great cigars for one low price in the Sweet 16 Sampler! Receive two cigars from each of the eight great blends representing the finest cigar manufactures for only $49.95! Here at Corona Cigar Co. we love a good party and we know you do too! The Party Pack Sampler is made easier for you and includes everything you need to get your herf party going. Packed full of our Exclusive House Blends you will receive 25 premium hand-rolled cigars for one great low price. So grab your friends and family, and this deal, and party on!